G-Way Microwave’s Knicks Control Board is a Software Controller available for CW and Pulse applications. 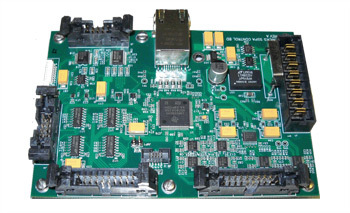 Upon purchase of the control board, a software protocol will also be provided. A user is able to change gain by modifying output power levels. RF Power may be displayed in dBm or Watts. Additional real time measurements include: Power Supply voltage, Reflected Power, Current, and Temperature. The additional real time fields are factory set for minimum and maximum limits. If the limits are exceeded, the amplifier will shut down. There are soft alerts specified to display alarms on the control screen whether via LCD Touch Screen or Ethernet/RS-232 Connection. The alert alarms are as follows: No output, VSWR detect, Maximum gain reached, Input power too high, and gain freeze. These alarms display alerts, but do effect the function of the amplifier.